Instructions for resetting the password will be sent to your email. A reset link will be sent to your email. - PCS - Professional Cornering System. - Precise response, excellent driving performance and high reserves of safety. - Lowering up to 40 mm. - EIBACH Pro-Kit performance spring with progressive characteristic. 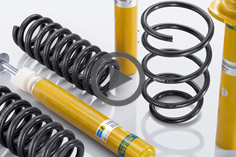 - Spring and shock absorber road-tested and fine-tuned to complement one other perfectly. - BILSTIEN gas pressure technology. Copyright © 2006-2019 BSR Svenska AB. All rights reserved.